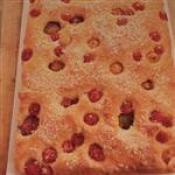 Cherry Tomato Focaccia - Sweet as candy, cherry tomatoes make this an unusually savory and attractive hors d'oeuvre or part of a meal. Bringing a little of the Mediterranean to your table. Well worth the love and effort spent in the making.